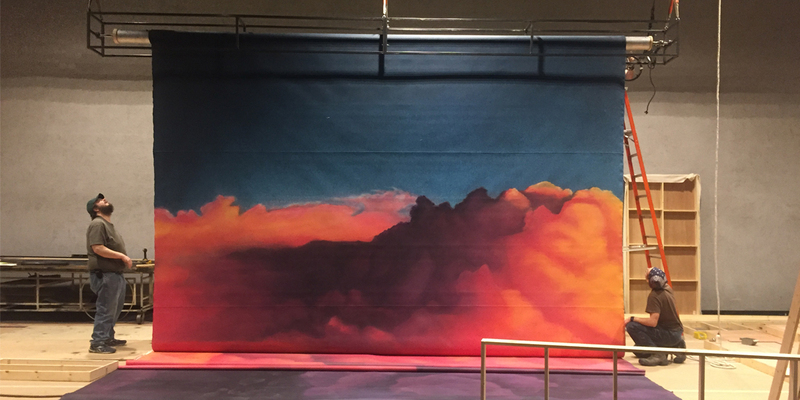 I was about to start working on the University of Minnesota’s Earthquakes In London at the Guthrie Theater’s Dowling Studio, when I had a “scenic artist lottery winning moment.” My designer, Torry Bend, handed me a glorious rendering of a sunset cloudscape drop. I might have actually squealed in delight. Out loud. 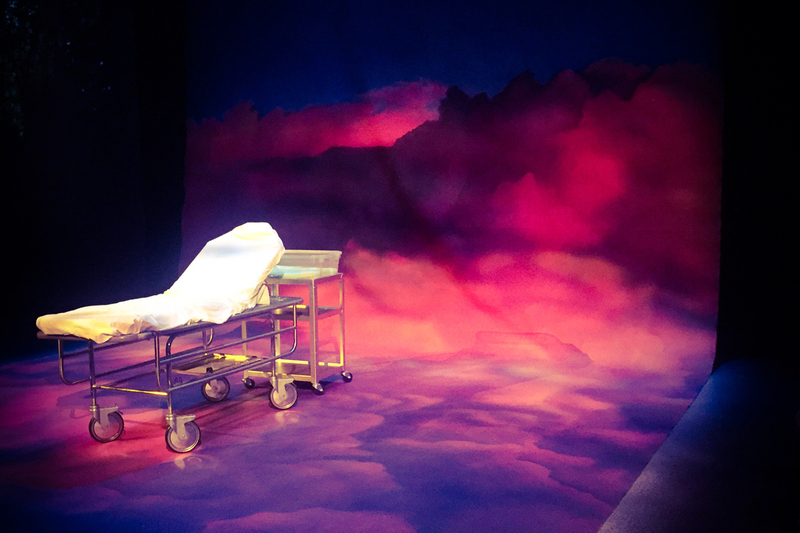 The catch: This massive 18’W x 55’L background isn’t just a drop – it’s also a groundcloth that actors walk on and several chairs get sat on and a hospital bed rolls across. And don’t forget about the audience members that will be sitting six inches away… oh, and they too will need to walk on it to exit the theater. 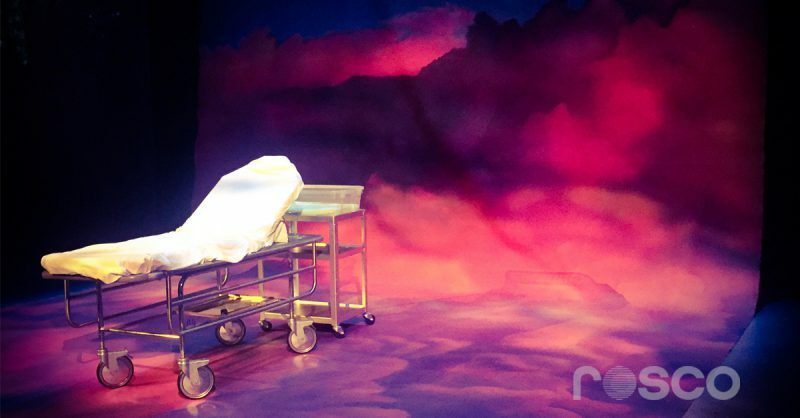 The other catch: it’s only on stage for the last twenty minutes of the show because it enters the space by unrolling onto the ground from the grid – live on-stage – for every performance. 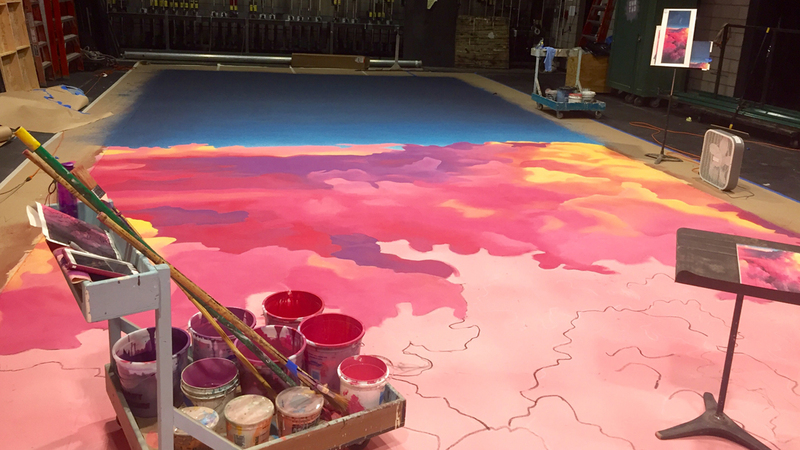 So how does one create a walkable heaven that can roll on and off stage every night? Crossing fingers, lots of samples and a phone call to your buddy Jenny Knott at Rosco to help figure out the right products is key. Because of the durability required, we ordered a heavier weight canvas drop and we sized it with tinted flex glue. This gave us a great surface to work on, gave the fabric added strength, and yet still kept it flexible enough to roll. Note: because of its close proximity to the audience’s feet, we ended up stapling every inch to keep it from scalloping. Rosco Off Broadway Paints were a no-brainer for painting the clouds – not just because they provided the rich and vibrant colors we needed, but also because when thinned to their extremes, Off Broadway keeps its color and remains highly flexible. I started with a somewhat pastel color palate for my initial blended base coat. From there, I mixed a couple more darker hues and then thinned all of my colors down even further so that I could use them as thin washes/glazes and build up the shapes and colors. Working with many layers of highly thinned paint, instead of just a few thicker layers, really helped keep the drop pliable – which is why it was so important to go with the Off Broadway. 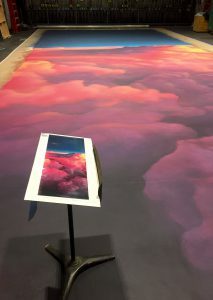 In the printed rendering, the bottom of the clouds went to an almost solid black, but that would have died and looked flat on stage. Instead I used Off Broadway Paynes Grey because I find it to be a much sexier alternative to boring old black. Using my multiple-washes method over the pinks and purples, the Paynes Grey stayed dark like we wanted, yet still had a beautiful glowing quality that looked good from afar, and close up. When we were finally happy with our clouds it was time to add a sealer coat. Once again, we needed something strong enough that it would hold up to lots of foot traffic but not crack when rolled. My initial samples included CrystalGel and it worked amazing – it even held up to a week of scene shop traffic. Unfortunately, it worked a little too well as it stayed very shiny – even after I coated it with a clear flat. That shine created a light-bounce that made it hard for us see the detail in the clouds. Then I tried using thinned Aqua Plastic Clear Dull Sealer, but even that was a bit too shiny. Enter Rosco’s Clear Flat Acrylic Glaze. I normally wouldn’t use this as a final sealer (it’s designed for glazes), but I found that it did an amazing job of dulling down the glossiness we were seeing from the Aqua Plastic. I was on pins and needles all through load-in and tech week, waiting for the late night “we need an emergency touch up!” call. Thankfully, that call never came. 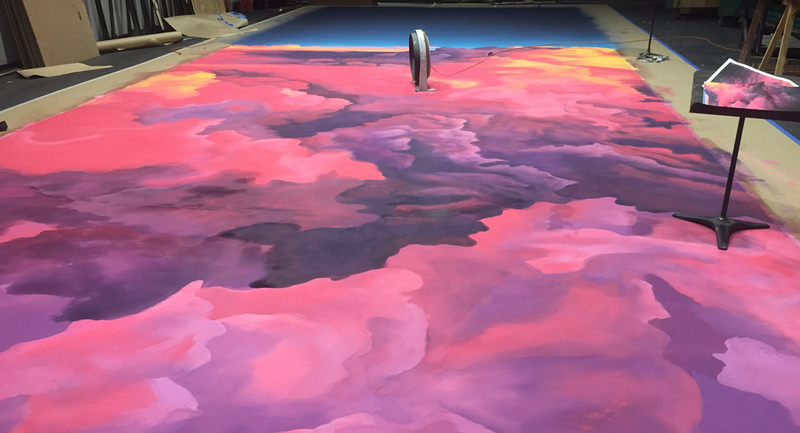 The drop held up wonderfully, looked gorgeous and ended up being a great project for the U of M scenic paint students to work on.